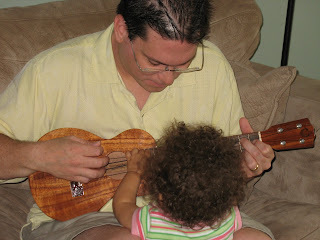 We figured that with two musically inclined parents, Olivia had a pretty good chance of being musical herself. She's proven this to be true. She has a Fisher Price "house" (thanks to Tutu and TutuKane) with a radio built in. She works that radio out! She pushes the button to start the music, then she pulls up to stand and "rocks-out" to the music. As soon the music ends, she reaches down and hits it again. She can go for... minutes! It's absolutely hilarious. A few weeks ago, Scott and Olivia sat in on my hula class. I looked over and she was clapping along with the ipu. How cool is that! 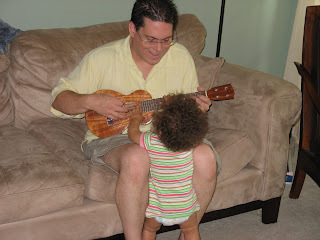 In these photos, she's alternatively dancing and trying to help Daddy strum the uke.